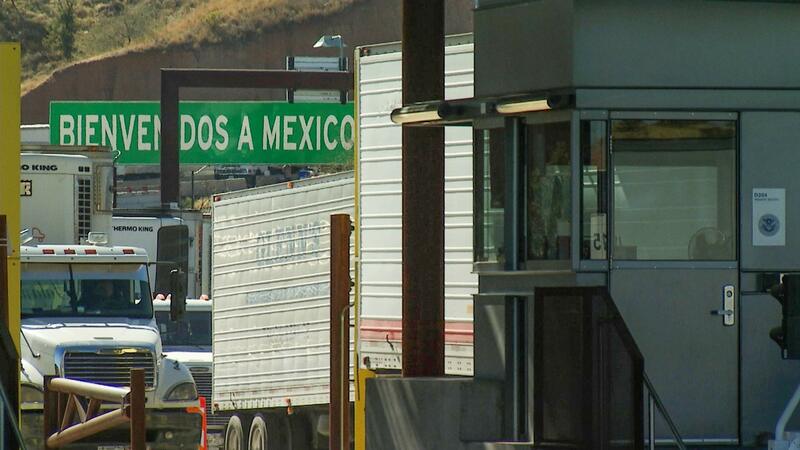 April 4, 2019 / Modified apr 4, 2019 2:49 p.m.
Trucks wait in line to cross into the United States via Nogales, while a sign reading "Bienvenidos a México" welcomes those crossing into Mexico. WASHINGTON — Abandoning his threat to immediately seal the southern border, President Donald Trump warned instead on Thursday that he'd slap tariffs on cars coming to the U.S. from Mexico unless the country does more to stop the flow of migrants and drugs coming to the U.S. In his latest walk-back in recent days, Trump told reporters he would try the "less drastic measure" before resorting to his standing threat. "Mexico understands that we're going to close the border or I'm going to tariff the cars. I'll do one or the other, and probably settle for the tariffs," Trump said at the White House. 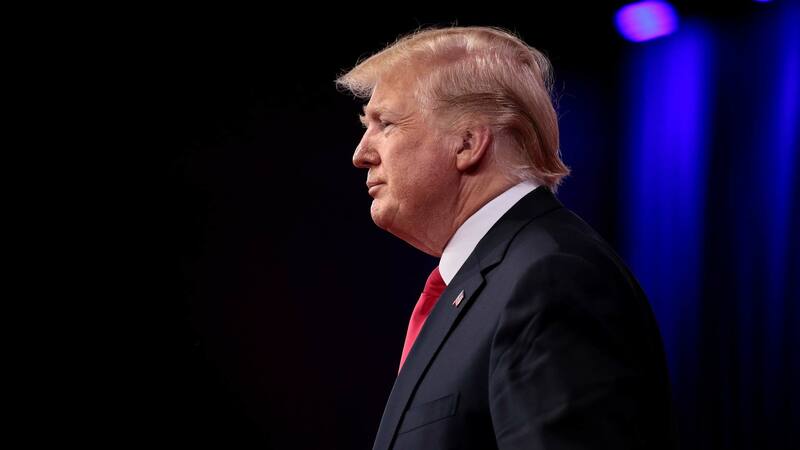 It was a dramatic departure for Trump, who last week tweeted that he would close the border or large swaths of it this week unless Mexico immediately halted "ALL illegal immigration coming into the United States." Since then, however, White House advisers, American leaders in border cities and U.S. economists have warned that such a move would have enormous economic consequences on both sides of the border, interrupting supply chains and boosting U.S. consumer prices on everything from avocados to autos. VIEW LARGER President Trump at the Conservative Political Action Conference in 2018. In recent days, Trump has appeared to put his threat on hold, praising the Mexican government for doing more to apprehend migrants traveling through the country from Central America. "We will put tariffs on if they don't apprehend, and ultimately we're going to give a period time. But if in a year from now drugs continue to pour in we're going to put tariffs on," he said, adding: "I don't play games." Separately on Thursday, House Speaker Nancy Pelosi said Democrats would file a lawsuit aimed at preventing Trump from "stealing" billions from federal programs and diverting the money to building barriers along the border. Trump declared a national emergency so he could use more money to construct the wall he's promised since his presidential campaign. Congress voted to block the emergency declaration, but Trump vetoed that measure. Trump has been increasingly exasperated by the swelling numbers of migrants entering the U.S., including thousands who have being released after arriving because border officials have no space for them. Arrests along the southern border have skyrocketed in recent months and border agents were on track to make 100,000 arrests or denials of entry in March, a 12-year high. More than half of those are families with children, who require extra care. With southern border facilities near a breaking point, U.S. officials are busing many migrants hundreds of miles inland and dropping them off at bus stations and churches. Trump has mocked and vowed to end that "catch and release" practice but overwhelmed authorities see no choice. Administration officials have been studying ways to minimize the economic impact of a potential closure in case Trump went through with his threat, including keeping trucking lanes open or closing only certain ports. But even absent that threatened extraordinary step, delays at border stations have been mounting after some 2,000 border officers were reassigned from checking vehicles to deal with migrant crowds.